If your child likes animals with human characteristics then this a really cool book. A mystery is solved along with (sssshhhh don't tell them) learning. The reader will learn about detective work as well as rocks and minerals facts. I would put this book at about 3-5 grade. The animals have personalities and humor is mingled in. At the end of the book there is a Did you know page, a page with terms to help identify rocks and minerals, a few experiments and a rock cycle chart. Be sure to visit Renee's web site for more fun activities to do also. In the midst of having her friends visit her rock collection, Maple Moo’s rare mineral goes missing from underneath her large cow nose. She instantly turns to Joe-Joe Nut and Biscuit Bill, the most famous detectives in Acorn Valley, to find it. But they didn’t know the task was going to be an impossible one. The suspects were hard to figure out. Was it Candy Cardinal, who committed the crime? She collects various gemstones to make jewelry. Brutus and Betty Blue Beaver also collect minerals and have a fancy quartz collection. Liam the Llama looks suspicious with his igneous rocks and exploding volcano, or was it Huckleberry Moose with his sedimentary rock collection? Joe-Joe and Biscuit find themselves at a loss until some bullies roar into town. Joe-Joe and Biscuit found themselves in a dark and dreary cave, and in front of them, sitting on an ornately carved stone pedestal, was Maple’s mineral. To reach out and take it would be so easy. It glistened like stars in a midnight sky, attracting their attention, luring them. There had to be a catch somewhere. Something wasn’t right. Joe-Joe and Biscuit stood beside the pedestal, analyzing it. There was a circle in the center of the pedestal, and the mineral was placed in the center of that circle. A TRAP! Thought Joe-Joe as he glanced at his partner, who was wearing a russet-colored fedora, which matched his own—they definitely looked sharp. Joe-Joe glanced behind Biscuit, where he noticed a deep gap in the wall. The opening was barred like a cage. Barely any light shined through to reveal what was inside. Joe-Joe had an inkling that, if he removed the mineral, the cage door would open, unleashing a horrific Greek beast that would assuredly eat them both for dinner. Joe-Joe began thinking like an adventurer. He was suddenly consumed with the identity of Indiana Jones. Renee Hand writes because it is a passion in her heart. She is a homeschool parent and likes to create books that educate and inspire the children of today. She was born in Michigan and still lives there with her husband and two children. She has a degree in Zoology with a minor in Chemistry. Renee is the author of the amazing mystery series known as the Crypto-Capers Series that encourages children to read by incorporating several topics of interest. The reader participates into the story by solving cryptograms and puzzles to solve the case. 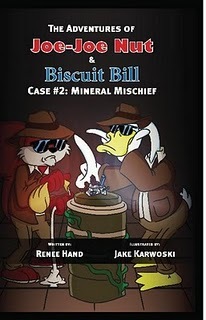 She is also the author of the Joe-Joe Nut and Biscuit Bill Series, which focuses on animal detectives. This series is a great way to teach children about animals in a fun and interesting way that captures the reader’s attention and yet fills them with knowledge they will be learning about in school. All books are great to use in a classroom setting to supplement various topics or to just enjoy. Renee is an award-winning author, receiving awards such as a Best Book Award, a National Literary Award and a Preferred Choice award for her children’s series and adult books. She has just recently won a Seal of Excellence award in Storytelling for her Joe-Joe Nut and Biscuit Bill Series. She has been writing for over twenty-five years and has nine books published. When she is not spending time with her family or participating in author events, she is coaching and playing tennis, as well as doing research for her books and many other things that keep her busy. Not quite sure what a cryptogram is and want to learn more? Visit the author’s website at www.reneeahand.com to learn about cryptograms and how to solve the ones that are in the books. Visit The Mineral Mischief Tour Schedule here and see where you can win a copy of the book. Thank you so much for the wonderful review. I greatly appreciate it. For anyone who would like to take book 1 for a spin, the e-book version of the Great Pie Catastrophe, is now available through Amazon for .99. Hope everyone will enjot it. If you could also post the review on Amazon, I would greatly appreciate it. Thanks! Thanks for the great review of Mineral Mischief. I'm glad you enjoyed it. I've been a fan of Renee's work since the first Crypto-Capers book came out. I can't wait to see what she comes up with next. I'd love to write a review on amazon but in the past I've tried and unless I buy the book from them I can't post a customer review, because I'm not considered a customer. I have tried several times in the past. Maybe I'm just not doing it right, but I post at other sites, but can't get amazon to post it. don't know what i'm doing wrong. However, I did love the book thanks. I am so glad you liked the book. It really is a lot of fun. Thank you again for reviewing it.